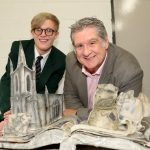 New-Bridge Integrated College Art students Nathan Hood and Alex Savage recently attended the Carson Awards Showcase 2018 in Belfast. Stars of all ages gathered at Lagan College in Belfast to celebrate creativity in integrated schools. Actor, writer and director Dan Gordon introduced the Carson Awards, featuring projects on the theme of integration. 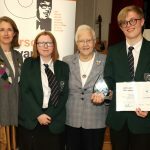 The audience of students, staff, parents and IEF supporters enjoyed an exhibition of entries to the Carson Prizes followed by extracts of films made by students, and a performance by Lagan College dancers, all produced through the Carson Bursary scheme. Trophies were presented to representatives of seven integrated schools by Baroness May Blood, IEF Campaign Chair. IEF director Marie Cowan thanked everyone for their contribution and encouraged all integrated schools to enter the next round of Carson Awards. The Awards were founded by legendary Northern Ireland comedian, the late Frank Carson and his son Tony and reflect their long standing support of integrated education in Northern Ireland as well as their commitment to celebrating the creative talents of young people. During the award ceremony, Nathan was presented with the first prize for KS4 by Baroness May Blood. Alex’s gifted art work was on display as first runner up. Former Year 14 student, Holly Kemp’s sculpture and embroidery work was also on display as awardee of the 2018 Carson Bursary. Following the awards, Nathan and Alex shared their work with NB Art Club where they took time to launch the 2018 – 2019 Carson Bursary and Awards. 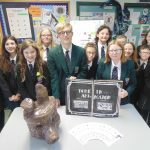 Our industrious Art students have used their experience in Belfast to share ideas and promote the bursary and prize which offers encouragement in exploring learning through the arts. Creativity is the key and entries can reflect different creative mediums such as, photography, artwork, collage, music, dance, stories, poems, short films, drama and comedy sketches. The creative arts are a force for the cultivation of key skills such as critical thinking, collaboration, problem solving, imagination, communication, agility and empathy. We are very proud of our school’s creative talents and we are pleased that our older students give so generously of their time to nurture the gifts and talents of those who are younger in our school.